Update: Why is unemployment in Spain so unbelievably high? Three reasons. Europe is an utter disaster zone. It's a banking crisis wrapped in a sovereign debt crisis wrapped in a mystery: How the heck do we unwind all of this? But when the day-to-day news about the euro's slow meltdown focuses on bond yields and stock jitters, we often leave out the most human statistic, which is the continent's extraordinary -- and extraordinarily uneven -- unemployment rates. 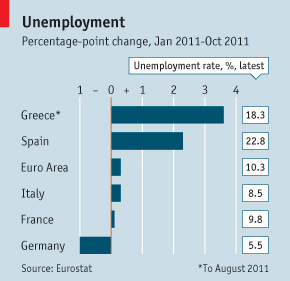 While Germany chugs along with 5.5% joblessness, Spain and Greece are battling unemployment around 20%. This year along, those countries' jobless rates have put on an additional 2% and 3.5%, respectively. Put another way, Greece already suffers from twice the U.S. unemployment rate and most economic observers think the worst is yet to come. Nothing shines a harsher light on the euro zone jobs crisis than this amazing graph from Reuters showing the remarkable growth in youth unemployment since 2008. The number you'll want to keep in mind: Half of the workers under 25 in Greece and Spain don't have a job. Never be surprised by another photo of European youth riots again.